Israel Adesanya put together yet another scintillating performance at UFC 230 with a first-round knockout of No. 6-ranked Derek Brunson to run his MMA record to 15-0 with his 13th knockout. As entertaining as Adesanya was when his fist and feet were flying, the Nigerian-New Zealander is just as exceptional with his words. His penchant for a snappy quip is just as crisp as his striking. 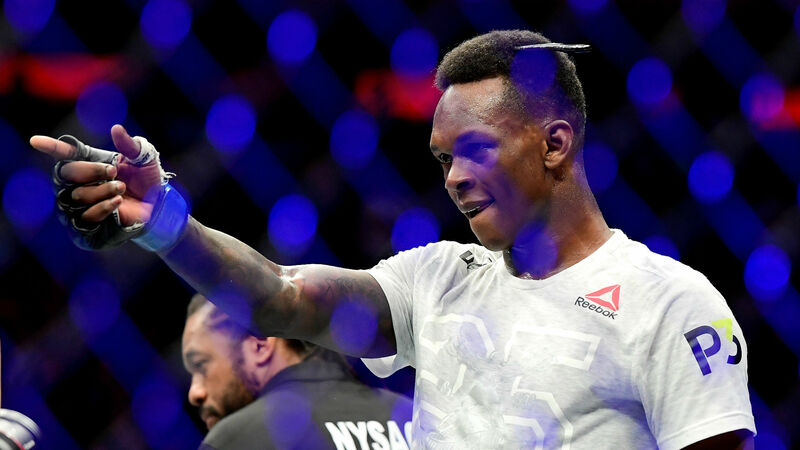 With four straight victories as a member of the UFC roster in less than a calendar year, Adesanya certainly has the makings of MMA’s next big thing. It’s almost unfortunate that people are already quick to peg him as the next iteration of another brash striking dynamo, who made a swift ascent up the ladder before breaking into the mainstream as a crossover celebrity. The parallels cannot be totally dismissed as McGregor had an astronomical rise upon his arrival in the UFC. After beating Marcus Brimage and a very young Max Holloway in 2013, McGregor was sidelined for a year. Upon his return, he reeled off four straight victories in 12 months, with the final victory during that timeframe being a second-round knockout of Chad Mendes to claim the interim UFC featherweight title. His mouth was just as lethal as his hands during his well-documented ascent and helped thrust him to the top of UFC cards and into the mainstream. Both McGregor and Adesanya are recognized for their devastating striking and questions have hovered regarding their respective ground games. But that’s where the comparisons should end. McGregor made it very clear upon his arrival that his goal was to make top dollar and he would say whatever it would take to sell a fight. The Irishman has always been calculated in his approach to trash talking and has often taken upon the role of a crazy-eyed maniac with an insatiable appetite for mind games. Adesanya has yet to share those same sentiments in terms of consciously selling a fight. Instead, Adesanya’s personality is one that welcomes verbal confrontation, but doesn’t necessarily seek to verbally shred his opponents prior to a fight. He’s outspoken and confident, but not crude with his approach to combat. He’s expressive and enjoys the spotlight, but it is something that he does in the dark as well as in the light. When it comes to striking, Adesanya is a kickboxing dynamo whose technique is among the best in mixed martial arts. Where McGregor has often relied upon his vaunted right hand, Adesanya looks to terrorize his opponents with all of his appendages. Against Brunson, Adesanya sniffed out his opponent’s takedown attempts with a standing knee, flicked a range-finding jab and set up a beautiful high kick before sending his opponent to dream street with a straight right hand. The Last Stylebender’s technique has derived from his exceptional pro kickboxing career, where he went 75-5-1. He has also tried his hand as a professional boxer, where he won six straight fights after losing his pro debut by decision in 2014. He’s already shown tremendous growth in his ground game and takedown defense. After squeezing out a split-decision victory over Marvin Vettori, who often put Adesanya on his back when the clashed earlier this year, Adesanya was paired with two exceptional wrestlers in Brad Tavares and the aforementioned Brunson. The result was far different as Adesanya demonstrated exceptional takedown defense and showed some much-improved ability to control the distance in an MMA fight, while showcasing the explosiveness that has become his calling card. Like McGregor, he’s already seeking a title shot. However, that has become the case for many unique talents who have made a swift climb to the top. Jon Jones rampaged through the UFC’s light heavyweight division that was stuffed full of future hall of famers before finding himself competing for a world title on relatively short notice against Shogun Rua. Cody Garbrandt is another fighter who tore up the scene in 2016 with four straight wins before snatching away the UFC bantamweight title from Dominick Cruz to cap off his torrid run. McGregor isn’t the first to make a swift rise, but is certainly the most memorable. Adesanya has proven to be a very different beast in terms of his approach, technique and magnetic personality. We often like to find the closest thing to compare a fighter to, but Adesanya should live on his own merit. He’s earned that right thus far. And he may only be scratching the surface of his spectacular ability as both a mixed martial artist and a bonafide star. White has made it clear that he’s not willing to push Adesanya to the top of the division as quickly, as the Nigerian-born fighter would like to see. However, White says a lot of things that don’t necessarily come to fruition. He certainly knows what he has with Israel Adesanya and mentioned that he has his next opponent in mind. The middleweight division where the 29-year-old resides has an intriguing array of talent. Robert Whitaker sits atop the division with the pecking order behind him including Jacare Souza, Kelvin Gastelum, Yoel Romero and Luke Rockhold. What’s interesting is that White might suggest not rushing Adesanya up the ladder, but he may have no choice. With Adesanya decimating Brunson in impressive fashion, Weidman’s (No. 3) knockout loss to Jacare (No. 5), Rockhold’s (No. 2) ongoing injury issues and Yoel Romero’s (No. 1) weight problems, the path to a world title shot may not be able to be avoided. With Robert Whitaker set to defend his title against the No. 4-ranked Gastelum, there’s very little room for White to maneuver. The only possible opponent that may make sense is against Paulo Costa, but that’s putting two touted prospects together with an effort to eliminate one of them. Nevertheless, Adesanya’s star is shining extraordinarily bright and there’s potential for him to become a breakout star in the world of mixed martial arts. Obviously, there are still many hurdles for him to clear that end up being the difference between Cody Garbrandt (fast rise, swift fall), Conor McGregor (one of a kind talent with a meteoric rise) and Sage Northcutt (pushed too hard, too fast). Who knows exactly where he will end up by this time next year. One thing is for sure, he has the “It” factor and the arrow on his stock watch is pointing straight to the roof. But, please, let’s not try to make Israel Adesanya the next Conor McGregor because The Last Stylebender is truly one of a kind.